The Clubman recognises and rewards the talents of unclassified shooters from across the board with a 75- bird competition comprising 50 English Sporting and 25 Single Barrel Down-the-Line. Overall Champion will win a fantastic Caesar Guerini Maxum 12-bore Sporter, worth more than £3,000 from our sponsors Anglo Italian Arms. Changes to this year’s format include the highest scoring Senior, Lady, Junior and Veteran after 75 targets (from both days) who will not only receive Fiocchi cartridges, but will also shoot 25 birds in a head-to-head competition on the Sunday in front of the Mitsubishi Grandstand. 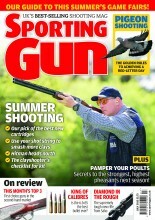 The winners will receive a stunning Fabarm Elos Sporter, plus a £250 cash prize donated by the CPSA. Clubs are encouraged to hold qualifiers to choose their teams, which consist of their top Seniors, Juniors, Ladies and Veterans. Any two-man team has to consist of ‘B’ Class Shooters and below, with clubs allowed to include a maximum of one ‘A’ Class shot in their five-man team line up. Sporting Gun will be giving away a free Midland Game Fair ticket to every entrant in the Clubman, providing entries are received by September 2. For full details on how to enter this great championship please turn to page 90 of this issue. Latest breaking news is that B Class shooters without a club can also enter on the day!